Customer experience encompasses every aspect of an organisation’s offering – the quality of customer care, of course, but also advertising, packaging, product and service features, ease of use, and reliability. How can you drive a consistently good and improving Customer Experience for your customers or prospects? In this A to Z I’ll give you some of the answers and some tips from Think Oak! I could start and finish this post with ‘A’ for Attitude. Not many people wake up in the morning and say “Today, I want to make life miserable for our customers.” Yet every day, employees at all levels of organisations make decisions that end up frustrating, annoying, upsetting or losing their customers. Changing people’s attitude is much harder than teaching them new skills. It is much easier to get staff to do the “right” things when you have hired people with the “right” attitude and who have a history of behaving the “right” way. You need to recruit people who understand that the aim in business is to have profitable customers who stay with you for a long time and, therefore, who realise that looking after existing customers so that they come back again and again is the Number One priority. Dealing with employees with the wrong attitude also needs to be a high priority for you as a leader. Tough conversations and ‘attitude’ management are a must if your are serious about a great customer experience. I’m a raving fan of all things Disney, and Disney takes behaviours and training extremely seriously and they do it very well. So much so that their methodologies are used in many other companies and organisations around the world. Almost wants you to become a customer straight away! What behaviours are central to your Brand Vision? Do your people know, understand and embrace these behaviours? What are you doing every day to embrace your organisation’s behaviours and set an example to your people? How do you drive collective positive energy around your organisation’s behaviours and more importantly are you hiring, developing and firing on behaviours? How many company vision statements state something along the lines of, “We put the customer at the heart of our business…” and how many companies truly organise themselves around the customer? There’s a difference between consistently meeting customer expectations and delighting customers, and the outcome is the difference between a satisfied customer and a promoter – a ‘Raving Fan’. Customers expect to have their requirements met. It’s a hygiene factor. You expect your local ATM to work and have money in it. You expect a company to know your spending history when you have a query. You expect your hotel room to be clean when you have an over-night stay. When this isn’t the case you may move your customer from satisfied to a detractor, who is very likely to leave you over time and tell others about their dissatisfaction. A satisfied customer is likely to leave you at some point for pastures that little bit greener. A promoter, a Raving Fan, will not. They will be loyal and they’ll talk about you positively to whoever will listen. How to delight a customer will vary widely depending on your products and services, but always be looking for the edge, differentiators that matter. Get your people to do the same. Fix the things that cause your customers to call you or cause them pain. Be easy to do business with. I’ve been an Amazon customer for over a decade now, and I’ve had to call them once and that was nine years ago. I literally spend thousands of pounds a year with them and they are so easy to do business with. I’ve never once understood a fuel or electricity bill and consistently feel frustrated with the whole industry. The day Amazon start selling fuel and electricity, I’ll move! Find ways to delight – it could be as simple as a free cookie on check-in like Double Tree by Hilton or a full valet when you take your car for a service. They stand out….for now. Finding ways to keep raising the bar in customer experience for your industry will ensure you maintain and grow market share as well as increased share of wallet. You can have the best Customer Experience strategy and tools in the world, but without the understanding, buy-in and passion of your employees your strategy is worthless. Please see a previous post ‘Communicate or Fail’ for some top tips! Don’t get me wrong, failure isn’t a good thing, but procrastination in getting a new product out of the door or not doing something because you haven’t got all the data isn’t a good thing either. Allowing yourself to try new ways of working, marketing, new products or service enhancements in a small way, and finding out quickly what works and what doesn’t from a customer perspective will help you to fail fast, tweak your proposition and try again. Once you’ve discovered what works in your marketplace you can then widen this out further and invest more energy and money into being successful AND providing a better a customer experience. If you’re a regular Think Oak! reader, you’ll know my passion for having goals, objectives and that you must measure progress against them. This is especially true of Customer Experience. Many organisations large or small, think that if you hire the right people and put in the right processes that Customer Experience will take care of itself. Wrong. If Customer Experience is to be truly part of your organisation’s DNA, then you need to have at least one strategic objective embracing it with underpinning goals that are regularly measured and an owner whose ‘raison d’être’ is to live customer experience. For some organisations this is where accountability stops. For Customer Experience to be embraced by everyone and for an organisation to be truly customer centric, at least one of everyone’s personal objectives should be around improvement of the customer experience. Heroes, your high-performing customer facing employees, can have a huge impact on Customer Experience, and when nurtured and recognised can truly accelerate cultural change in an organisation. When a company celebrates sales, they sell more – but perhaps at the expense of delivery issues. When it celebrates product management, new products come out quickly – including those without customer demand. But companies with a great customer experience use the customer feedback to understand their level of customer satisfaction, and then celebrates those who engage customers at a superior level. Who are the often unsung proponents of customer experience in your organisation? Is it the receptionist, whose sunny disposition brightens up the day of every customer the speak to? Is it a security guard that always goes out of her way to be accommodating for unexpected customers arriving at your car park? Is it a sales person that goes the extra mile to ensure that the customer gets what they’ve paid for on the day they’ve been promised it? Find these people and make them an example of ‘what we do around here’ and what good customer experience looks like. Tell these stories in company emails and newsletters. Reward your heroes and put them through further development, give them new opportunities to shine and you’ll be amazed at the halo effect these people have in your organisation in a short period of time. Keeping abreast of what competitors and industry thought leaders are doing and saying is crucial in order to stay ahead of the game with your customer experience. If we look at the demise of Comet or Jessops as an example. Today’s fast-paced retail market demands an environment that provides shoppers compelling reasons to buy in-store and to convert that sale. By offering too little information on products and poor employee training, retailers like Comet force customers in-store to use their smartphones to check reviews, product specs, and inevitably competitor and price comparison websites. All too often this approach will result in the customer leaving empty-handed and looking to purchase elsewhere. To survive, high-street retailers, as well as other industries, must operate as a cost leader and adopt a genuine integrated multi-channel approach. They must think about how shoppers want to buy and to be treated – Apple’s showroom approach is a great example of an engaging environment and people that enhance brand loyalty. In today’s ‘hyper-connected’ marketplaces, customers can interact with your organisation in multiple ways. They expect a certain level of service using each of those channels – if they tweet to your service department, they expect a response within seconds or minutes. If they email you, they expect a response within the day or sooner. And so on. They also expect you to know who they are when they contact you, how many of your products and services you use, how much you spend with them and ideally know why you might be calling them. How do you ensure that you deliver your brand values across all of these different media with the right customer experience for them as individuals? Even though most companies have created systems to address most of these channels and touchpoints, they often created them independently, making it difficult to maintain consistency and know what happened in other interactions to improve the next interaction. This often results in duplicative systems and processes, which are not only inefficient, but also costly. The lack of a seamless dialogue between the customer and you across all touchpoints creates customer frustration, which results in lost sales and lower customer satisfaction. Unlike the customer of a decade ago who did not have easy access to product information and multiple avenues by which to locate and purchase products, the customer of today can easily access information, compare prices and formulate product or service questions in the comfort of their home, office, train or local coffee shop. Today’s customer wants the convenience of researching and making purchasing decisions without having to leave their home or office. Does your web presence allow them the ability to acquire enough knowledge about your product or service to make a purchasing decision? Is it possible to make a purchase right now? Twenty-four hours a day? On the other side of the world? Because your customer has the ability to perform their own research regarding your product or service, they expect your employees to know even more! Have you ever asked questions regarding a product or service only to feel that you knew more than the employee? Your customer expects your employees to be experts. Are your employees trained properly? Do they know the history of your company? Do they know how your products are made? Materials required to manufacture the product? Can they provide comprehensive answers regarding your service concept? Are they familiar with your competitor’s products/services and how they compare to your offerings? When today’s customer interacts with your company, they want assistance from competent, knowledgeable employees. This 4 point plan is very effective in ensuring you keep focussed and continuously improving your organisation’s customer experience. Listen – Capture customer feedback and sentiment as often as you can, wherever you can. Obviously regular formal research, is very useful (See A to Z of Marketing), but any interaction with a customer is an opportunity to capture information that could be useful to your organisation. Think – Gathering information and reporting it to ‘management’ is all well and good, but without analysis, thought, insight and recommended action, it’s pretty useless. Certainly from a customer’s perspective. This is not a one-off activity! Do – Once you’ve listened and thought, you need to act on this insight. What are you going to do differently? You need a plan, you need to execute against it and you need an owner to drive it through. Learn – Any changes you make to the customer experience need to be measured and improved upon which takes you back to Listen – get feedback on your changes. Has the customer experience been improved? By how much? For which customers? Jan Carlzon, former President of Scandinavian Airline System (SAS says, “A Moment of Truth is a chapter in which the customer comes into contact with any aspect of the company, however remote, and thereby has an opportunity to form an impression.” Each customer contact is a unique, unrepeatable opportunity for a company to differentiate itself from the competition. Every decision should be made with the customer in mind and viewed as another opportunity to make a favourable impression. Unfortunately, failure to satisfy a customer on any Moment of Truth will quickly destroy the customer’s memory of good service. On the other hand, getting it right can erase many if not all the wrongs that the customer previously experienced. Net Promoter Score (NPS) is used by many of today’s top businesses to monitor and manage customer relationships. 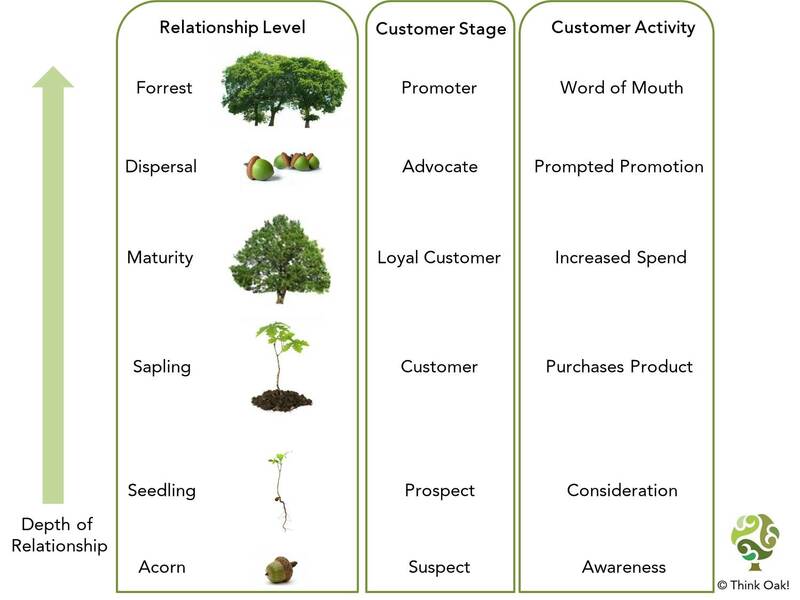 It is a useful measure of the likelihood of successful WOM (Word of Mouth / Word of Mouse) of your customer base (see W). I would argue that it is only one measure of customer satisfaction that you should be measuring, as by itself does not give you the breadth of detail you’ll need to address any issues that arise. A company can calculate its Net Promoter Score by simply subtracting the proportion of Detractors from the proportion of Promoters. A successful Net Promoter program includes several factors that work together. Although NPS is useful, the most prevalent cause of failure in Net Promoter programs is the inability of the organisation to go beyond the metric and build out a complete operational model with NPS as its centerpiece. The breakthrough in Net Promoter comes from shifting the entire program from a research model to an operational model and embedding it in the business. As the online channel has evolved, the customer journey has become more complex, and we’ve seen customers exert increasing power and influence over their relationships with brands. I could and will write a whole post on ‘Everything E’ in the coming weeks, but will outline 3 core areas of focus that you should think about for your organisation’s online strategy. First, realise that it’s no longer acceptable to deliver a one-size-fits-all online customer experience. Instead, you must demonstrate that you know your customers by providing them with a relevant and personalised online experience that takes their preferences, behaviour and past history with your brand into account. Second, understand that social networks like Facebook and Twitter have raised customers’ expectation levels for online interaction both on and off of social networking sites. To fulfil these expectations, provide your customers with an online experience that makes it easy for them to interact socially with your brand by incorporating user-generated content capabilities such as ratings, reviews or comments into your web presence. Lastly, with the widespread use of mobile phones and tablets, the online experience is no longer restricted to the traditional web presence accessed on desktops and laptops. Instead, today’s customers are taking the online experience with them wherever they go in the form of a mobile phones, tablets and televisions. As I stated earlier, making an experience a personal one for a customer, can really drive customer loyalty and customer recommendations. Personalisation isn’t simply a case of adding a customer name to the top of an e-mail. It’s now possible for organisations to communicate with their customers about their individual interests and preferences. The degree to which the experience is able to be tailored towards the needs of the individual and reflects their particular circumstances will vary by market. Customers of Amazon have long marvelled at how the recommendation engine is able to find items that seem to particularly appeal to them as individuals are then able to set a delivery date that meets their requirements for time and cost. Regular customers at the Ritz Carlton love that their favourite drinks and snacks are already in their bedroom when they arrive. Almost every customer I’ve met of the bank First Direct is a Raving Fan. Why? Well they’re treated as individuals, they feel listened to, their issues are resolved first time. Innocent drinks are now hugely popular in the UK and sold in 14 other countries around the world. When they started selling smoothies, this was not the case. The founders sold them at music festivals whilst holding down full-time jobs. Their founding mission was to serve their customers high quality natural, fruit ‘smoothie’ drink prepared with the best quality raw materials within an affordable price and gradually increase their market share every year. At the heart of the business was a quality, healthy product that did people some good. Innocent Drinks are known for their quirky, tongue in cheek approach to branding and marketing. They nurture a ‘friendly’ image – Instead of printing the normal small print list of ingredients, Innocent instead print their text in a larger font and include jokes and other amusements in their lists of ingredients. An example, from the blackcurrant flavoured spring water drink, is the inclusion in the ingredients list of ‘1 woolly jumper*’. Following the asterisk gives the reader the word ‘baa’. Sheep are not, of course, an ingredient in the drink. This is one example from hundreds they’ve incorporated into their brand and culture to make them a brand that customers want to be associated with. In today’s hyper-connected world, customers can interact with a brand, through multiple channels. They do not split their dealings with a brand into experience by channel, they just experience ‘the brand’ as a whole. It is true that some channels will be stronger than others within a brand’s marketing mix, but the strength of the experience is weighted by the weakest channel across customer interaction. For the single customer view, this means that brands must focus on a unified customer experience and appreciate the role of the individual within that process. The quality of each channel must be consistent whether Facebook page, Twitter stream, mobile application or sales assistant in the retail outlet, and the focus should always be towards the customer. Investing in the tools and technology to make this happen will give you the return on investment several times over, especially as many of these tools are much more readily available and affordable than ever before. Competing in the ‘Age of the Customer’ relies heavily on your ability to deliver technology that improves the customer experience. In order to deliver this, you must understand your customer experience ecosystem – the complex set of relationships among your company’s employees, partners, and customers that determines the quality of all customer interactions. With constant technological advances, businesses have a variety of ways to instantly transform the way their customers interact with their businesses. For example, you can use social media for real-time communication with your customers or adopt a customer-relationship management system to manage customer preferences. Here’s the catch. Your people need to understand that the importance of capturing, cleansing and using the information in the systems. Technology can help, but you need well-trained and motivated teams to truly transform your customer experience. The ability to understand and share the feelings of customers is essential to providing better customer experiences. If you understand your customers, you’ll be well equipped to give them exactly what they need. Here are 3 specific ideas that you can use to engage with customers to build a deeper level of understanding. Customers share their experiences with companies all over the Internet. It’s likely you’ll need special technology to mine through thousands of social media posts, product reviews, e-mails and so on, but doing so can help you gain insight into what your customers think/feel about your organization. Collect and share this data with everyone in your company and talk about ways you can use it to improve customer experience. Mystery shop yourself and your competitors and track your experiences. Walking a mile in your customers’ shoes is the fastest way to gain insight into their perspective and how they experience your organisation first hand. Make a detailed illustration of your customers as they travel through different parts of your organisation. Map out their experiences. Have employees walk through the customer journey, describing and discussing what they see from the perspective of a typical customer at any given touch point. You’d be amazed at what you’ll find! Do you have Brand Values in your organisation? Are they customer focussed values? More importantly do your people display these brand values? If you answered no to any of those 3 questions, you have some work to do. More than at any time in history, Word of Mouth and especially Mouse is having a huge influence on purchasing decisions and behaviour of customers and prospects. Whether as a consumer or a business decision maker, I seek the opinion of those I trust before I make a purchase decision. Do you know who influences your customers and where? How do you influence these influencers? Whether offline or online, you need to understand who these people are and who they’re connected to. I would really recommend Malcolm Gladwell’s book, ‘The Tipping Point’ to understand the power of the Maven – the information specialist, and the Connector – a human social hub, the people who know everyone and have large personal, business and social networks. Y – Yes it matters! By now you should realise, if you didn’t already, that Customer Experience matters. You can differentiate on customer experience and you should! It should form part of your organisation’s strategic objectives, it should be front of mind alongside growing revenues, managing costs and pleasing your key stakeholders, because whether you like it or not, customers are stakeholders in your organisation – without customers, there is no organisation. Be Proactive – The best way to avoid a problem becoming a disaster is to be proactive. Build monitoring into your processes so that you can quickly find the route-cause of problems when they occur. Act Quickly – Don’t wait for an army of customers to complain about the same issue before your start to act. Reacting quickly to a problem might mean you can contain the problem to a small number of customers. Ensure that you have built training and escalations into your problem resolution processes so that decisions can be made quickly. Listen to Customers – Ensure that you listen to your customer. Apologise – Effectively communicating empathy and apology throughout the service recovery can rebuild customer relationships and trust. Assure your customers that their problem is important to the company and that it will be addressed. Communicate – If the problem cannot be resolved quickly, keep the customer updated on progress at regular intervals until it’s resolved. Exit Effectively – Once the problem is resolved, give the customer the best explanation you can, compensate them if appropriate and give them the confidence that this will not happen again. When you resolve failures quickly and effectively, acknowledge and apologise for the problem, and then respond to their critical need, most customers will pay you back with continued or increased loyalty, goodwill and even perhaps, repurchasing. Even major service failures are opportunities to show the reliability of your customer support functions and provide the most positive experience possible, moving you from Zero to Hero! I hope you enjoyed this A to Z, and as always would love to hear your feedback and stories of great Customer Experiences!